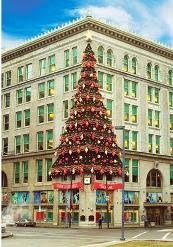 Sponsored post by Fifth Avenue Place ~ bringing you all the info for holiday fun in Downtown Pittsburgh! More info and the Fifth Avenue Place calendar can be found here. Friday, November 8 ~ 10 a.m. - 2 p.m. The holidays are just around the corner. Are you already looking for that perfect holiday gift? Pick up a special holiday card for your family and friends at the American Cancer Society Card Sale and give the gift of hope. Specially designed Pittsburgh scene holiday cards, created by local artist Linda Barnicott, will be on sale this one day only. Previous collectible holiday cards created by Linda Barnicott will be available. Other items for sale will include: large framed paintings of Pittsburgh, large unframed prints, mini framed and unframed prints, ornaments, note cards, magnets, and mugs. A portion of proceeds benefits the American Cancer Society. For more information about the American Cancer Society, visit their website. Have you ever wanted to make your own jewelry? Have you tried searching for rare and unique beads, only to come across the same old designs? Crystal River Gems is your solution! During their Bead Trunk Show on November 12 and 13, Crystal River Gems will be offering one-of-a-kind beading supplies just for you. Browse the huge selection of ornate beads, stones and more, and create beautiful custom jewelry for you and your friends. While you’re there, sign up for one of Crystal River Gems’ beading classes, where experienced designers and teachers will give you the inside scoop on jewelry-making! Want to limit your plastic bag usage and save 40% on custom jewelry and other wonderful gifts of nature? Visit Crystal River Gems on November 14 and 15 to shop the semi-annual Fill-a-Bag Sale! Here's how it works: Stop by to pick up your FREE reusable tote bag, fill it with your favorite glass art, beaded jewelry and much more, and save 40% off all items in the bag. If you’ve been admiring a certain gemstone earring set, agate slice necklace or Glass Eye Studio paperweight, now’s the time to explore the wonders of Crystal River Gems and treat yourself to a discount you won’t want to pass up! Please note: Offer excludes sale items. Friday, November 15 ~ 10 a.m. - 3 p.m.
Friday, November 22 ~ 5 - 9 p.m. 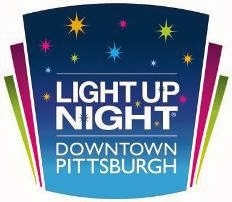 Kick off the holiday season with Pittsburgh's biggest celebration - Light Up Night! Fifth Avenue Place is hosting a magical evening of festive family entertainment, so mark your calendars! Join one of Pittsburgh’s best known neighbors, Mr. McFeely, thousands of Pittsburghers, majestic bagpipers and a splash of fireworks to kick off the official lighting of the historic Unity Tree ~ presented by Highmark Blue Cross Blue Shield. Visit Pittsburgh’s very own version of the North Pole at the Fifth Avenue FREEZE! Life-sized carving of Santa comingdown the chimney will fill the chilled air with warmth of wonder and magic. Get up close and snap photos with Ice Penguins, Snowmen, Doves and more. Enjoy live ice carving shows while kids test their skills at Arctic games. Catch up with the Children’s Museum of Pittsburgh and create your own Luminary to light your way throughout downtown. Snap photos with our holiday costumed character “Baby Penguin” and celebrate with a commemorative Airbrush Tattoo. Roger Barbour Jazz Quartet 4:30 - 6:30 p.m.
Max Leake Trio 7:00 – 9:00 p.m.
Every Saturday beginning November 23 through December 21 & Friday, November 29 11 a.m. - 5 p.m.
Fifth Avenue Place, The Rink at PPG Place, One Oxford Centre, Macy's, and U.S. Steel Tower (Pittsburgh Crèche). Enjoy FREE Parking with any $20 Fifth Avenue Place retail purchase in the Fifth Avenue Place Garage on Evenings (enter after 4 p.m.) and Weekends. Live musical performances from some of Pittsburgh’s favorite artists bring the sounds of the season to life during the always entertaining Lunchtime Concert Series. Saturday, November 30 ~ 11 a.m. - 2 p.m. Yes, there really “is” a Santa Claus and you’ll find him at Fifth Avenue Place. Stop by after the parade, meet Santa in person straight from the North Pole and receive a special Surprise. One of Santa’s favorite helpers, The Children’s Museum of Pittsburgh, will be on hand with their own little workshops making Poinsettia pins and sun catchers. And, kids can display the colors of the season with creative face painting.